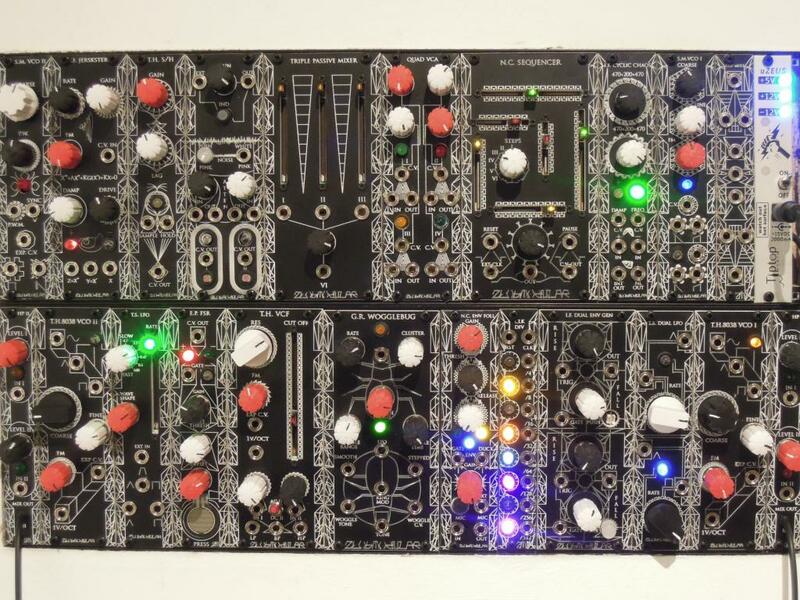 I'm offering Eurorack laser cut blank panel and custom faceplate service worldwide. For the blank panels I can cut just about any color of acrylic cast or extruded, and even wood is possible. Offered sizes are 1hp-42hp(could go up to 110hp, because the cutter bed is 24" wide) and I charge half as much as doepfer does for blanks. I also make custom acrylic faceplates for DIY or other designs. I can cut in normal or two tone acrylic. various two tone colors are available, you can check inventables website. For custom panel pricing pm me. I'm located in Chicago. I have a relatively fast turnaround and can have blanks or custom faceplates cut and shipped within a couple days depending on material availability. I will also beat razorlab/ponoko prices. here are some blanks i did for a fellow wiggler in Norway. No one? I guess there was more interest in the euro part of the forum. My services aren't euro specific, but acrylic is well suited for smaller formats. Yea if you send art work/ panel design(preferably Adobe illustrator format)I will engrave the text and cut the holes. I can also do layouts. there's lots of examples of what different acrylic colors looks like engraved and cut on that inventables link above. Usually extruded has a different shade to the original panel color when engraved, cast has more of a white color when engraved. Yep you got it, two tone is pictured above black and when engraved white underneath, there's different color schemes of that as well but it's a more expensive product. Pm me for more specifics and price quotes. This sounds encouraging. Adobe Illustrator is $$$$ and I don't have a license. Can you deal with any other vector graphics file formats? I have Visio, and I don't have, but am willing to learn Inkscape (which claims to be able to export to: "PNG, OpenDocument Drawing, DXF, sk1, PDF, EPS and PostScript export formats"
Your avatar looks like son of romanf's avatar. I am interested as well, though I don't have anything specific I want doing right now. 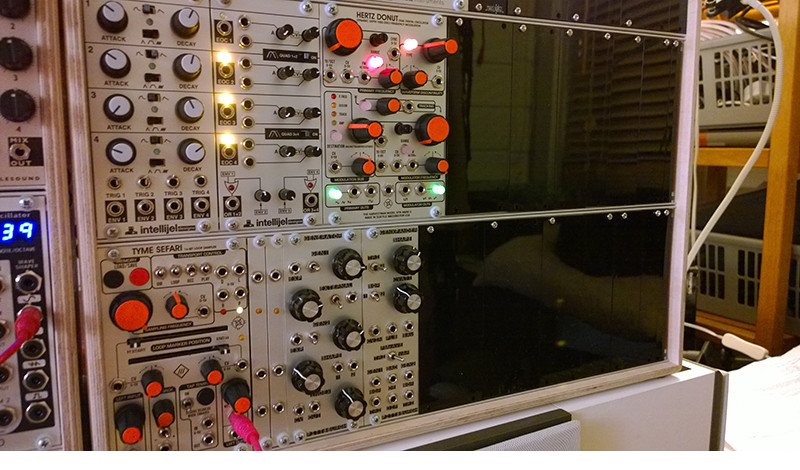 I spotted your modules/panels on the grid btw and think they look great!! Yea any vector file format is fine. I do all my cad work in rhino, but the laser cutter I use runs through illustrator. It probably would be hard to convert to .ai on your side. Ha. Yea I always wear a mask or a costume when I perform. 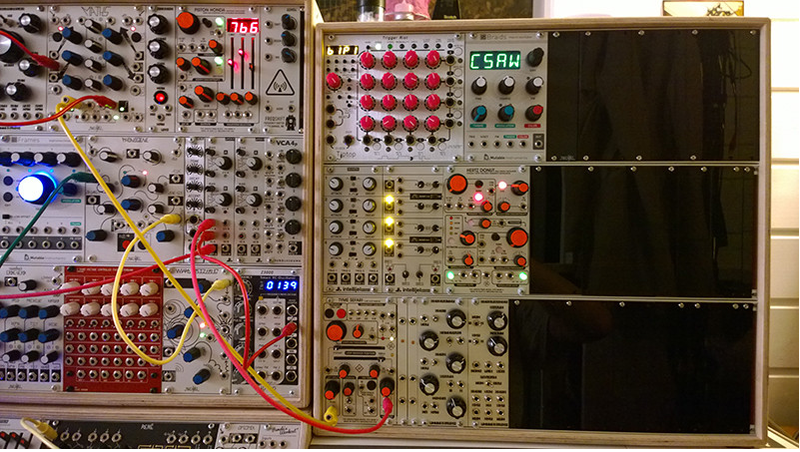 My profile pic is from just before a modular performance a while back. Thanks. Yea I just made a revision of the zlob clock divider and sold a prototype to a wiggler last week. I plan to do a pcb run soon. It's going to be a 2hp euro clock divider which to my knowledge doesn't exist. I will post something separately about that soon, to gauge interest. wow! very nice design on that bottom photo!! I need panels for 3x84HP...white, 3mm. I usually use Razorlab (UK Ponoko), cause they are cheap and fast! Could you beat their price? For my designs, 3x84 HP with shipping (to Hungary) would be around (after checking their site) 200-220 EUR. that NC sequencer looks pretty wild SlayerBadger! thanks, yea its based on nic collins's sequencer, theres no pcb at the moment, so if you want it, it would have to be on a protoboard. need panels for 3x84HP...white, 3mm. yea i will beat their prices, im not sure what you mean by 3x84hp... 3 separate panels that are 84hp wide? you want 84hp blanks? the acrylic i cut is 1/8", so its a bit thicker than typical euro panels. never had any trouble mounting pots, but i dont deal with so much panel mounted stuff. Are you serious? That is a ludicrous price for acrylic blanks. It may even be a ludicrous price for aluminium blanks. With FrontPanelExpress' free FrontDesign software you can generate blank 3U panel templates in DXF format (correctly-sized plain panel with only the mounting holes added) in comfortably less than 30 seconds. New design => partial 19" front panel, specify 3U/whatever HP => add system holes (specify Schroff) => delete the extra holes that you don't need => export to DXF. Job done. If you have a local hackerspace with a CNC laser cutter, you can set up the machine and cut out the panel in no more than another 5 minutes. Maybe 15 minutes if you have never used the machine before and need someone to instruct you. The material is pretty cheap. OP, your panels look cool. Serious like! Sorry guys, Im not talking about blank panels. Im talking about panels in diff size for a full 9U euro system. Razorlab uses 3 mm thick acrylic, which is Ok. Bit hard to mount the jacks, but still ok.
Well I cut 1/8" acrylic which is 0.125". 3mm is 0.118". Typical euro panels are 2mm. I always felt any acrylic thinner than 1/8" was too floppy for euro panels. Even 1/8" has a tiny bit of flex. Ive never had any trouble mounting jacks or pots on 1/8". That whole black and white system pictured from the original post is all 1/8". If your still interested snaper pm me. hopefully by the end of the month im going to start doing custom cnc'd aluminum faceplates too. no screen printing for the time being but engraving is possible. I am interested in acrylic panels and my point of reference is laser etched panels I purchased from Thonk as part of the Turing Machine kit. These are 3mm and seem plenty sturdy for a 3U panel, although they might get a bit floppy for 4U or taller panels. Looking at the panel, it seems that if it was any thicker, the Erthenvar jacks I am fond of would not work. As usual Euro is an exercise in finding things that are small enough... Is 3mm acrylic stock available? I am primarily interested in clear color/tinted panels with laser etching that I can infill with enamel and backlight with LEDs (like the Turning Machine). Im still interested, yes, but that thickness is big for me. i measured the various acrylic i have with calipers and found that i have both 3mm and 1/8". even material ive bought from 2 different sources sold me 3mm acrylic saying it was 1/8". so 3mm is no problem. Glad to know your'e doing this.. i have a few designs i wouldn't mind having you kick out... and in chicago too! I would be! But I'm a complete noob in panels as I've only purchased ready made panels for ALL my SDIY stuff over the last 2 years of SDIY! Yea ask away. I can also design them for you, however you want. What is a minimum quantity to do a customize panel and what kind of pricing would it come to? There's no minimum quantity. The pricing depends on what type of material, how much material will be cut, and labor. Pm me if you want a quote.